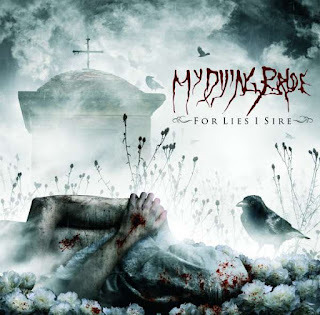 My Dying Bride are a curious beast. For 19 years they've been walking the line between awesome doom/death and Gothic Gruyère. I've been following along, in varying degrees, since Turn Loose the Swans. Their last album, A Line of Deathless Kings, grew on me immensely, and I had it in constant rotation for a long while. Almost every song had a memorable vocal melody or guitar riff to distinguish it. On first listen, the songs on For Lies I Sire suffer for lack of that distinguishing characteristic. As always with My Dying Bride, though, repeated listens do bear out the intricacies of the songs. For Lies I Sire finds Aaron Stainthorpe almost exclusively singing clean vocals. Coming at My Dying Bride completely cold, I'd imagine that a new listener might have a hard time stomaching Aaron's anguished warble. As with all things in metal, it's an acquired taste. The vocal melodies here aren't as adventurous or memorable as they were on A Line Of Deathless Kings, at the very least. Katie Stone's violin is a welcome addition. It serves roughly the same purpose as Martin Powell's violin work in the classic days. The violin sound here, however, is somehow unsettling and at times almost filthy. I like it a lot. The drums mostly plod along with the doomy tempo. Some of the best moments on the album occur when new drummer Dan Mullins breaks loose and joins the guitars in an upbeat and thrashy rhythm. For me, almost every My Dying Bride album has at least one unbearable, cringeworthy moment. On A Line Of Deathless Kings, it was the intro to "The Blood, the Wine, the Roses." Hell, the lyrics to the average My Dying Bride song would make many a metal fan run to the hills. On For Lies I Sire the first unfortunate moment is the lyrical intro to "Fall With Me." Aaron croons, "A great God lies naked, next to me. I witness death in his beauty. I feel him when he breathes, as we fall. And I clasp him to me, as we fall." Not my thing. The second awful moment, unfortunately, coincides with the heaviest song on the album. On "A Chapter In Loathing," Aaron tries out several evil, growling voices while a rare blastbeat chugs along. Unlike the masterful growls that came back with The Light At The End Of The World, he sounds kind of Dani Filth here. Oops. For Lies I Sire fits comfortably into the context of My Dying Bride's modern output. It doesn't hold my interest as much as A Line Of Deathless Kings, and it certainly doesn't match the modern mastery of The Light at the End of the World or The Dreadful Hours. The album did grow on me slightly with repeated listens, but it didn't ultimately catch on. Giving the uneven and ever shifting My Dying Bride catalog, I still have hope for the next time. My Dying Bride are like the fine wine of metal. The average metalhead consumes copious amounts of beer, and enjoys a quaff of the whiskey. Do they venture beyond a jug of Carlo Rossi? Most likely not. That probably explains why My Dying Bride haven't visited the US in over a decade. gothic gruyere is an awesome bit of wordplay. the foodie in me doffs my cap to you. Thanks. I find that the world of cheese offers so much in the way of alliteration.